Over the past day or two, the Euro has been consistent in depicting an embedded shortwave with associated surface cyclogenesis across AL/GA on Sunday. A broad warm sector spreads across the area and with a good amount of shear, it looks like severe weather, including tornadoes, is a good bet. The other synoptic models have generally been in their own world, but they are converging towards the Euro's solution. Since SPC has introduced a risk area for the threat, I'd thought it'd be a good idea to start this thread to keep the general severe wx thread from getting cluttered. Northward extent of the warm front will be important. The euro, which has been leading the way with this threat, is showing lots of convection north of I-20/59. Boundaries left behind near that convection will enhance the threat is certain regions. This is one of highly mesoscale dependent events. I have a few concerns with this event, however this one is paramount. Even with all of the convection the Euro shows, it still pumps instability up across most of the deep south. The NAM lifts the precip northward into Tennessee rather quickly on the flip side. These scenarios always freak me out, so I'll side with the slow moving warm front/messy idea for now. SREF/UKMET are the 12z suites that are the slowest and likely largest threats. NAM/GFS are a bit faster with cyclogenesis and progression eastward with everything. 12z euro will be running within the hour. SREF already has 45% sig tor probs at the end of the run for MS.
mention of rain has been removed for the northern half of the CWA. a warm front on Sunday morning. tornadoes will be added to the HWO. night into early Tuesday morning, but confidence is quite low. the morning hours on Tuesday and Wednesday. Models appear to be converging on the EC depiction for Sunday, with both the 12Z GFS and Canadian models taking notable steps towards the Euro solution. I have some questions regarding WF placement, destabilization, storm mode (specifically whether storms can outpace the cold front/linear zone of ascent) namely.. but man the QPF depiction from the ECMWF paired with the kinematic profiles presented are hard to ignore. Gonna be interesting to see this one play out. 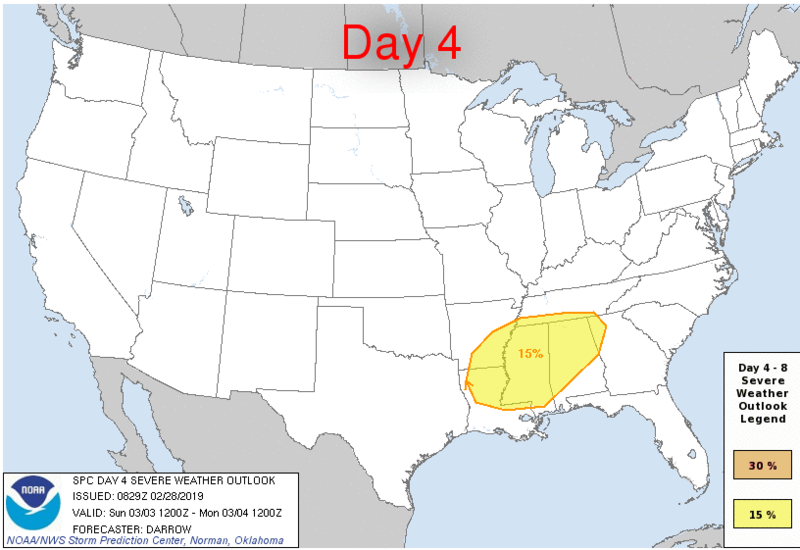 Should be one of a few systems that will likely bring severe through the month of March... could be an active spring in my opinion. 12z EURO has a 1000mb surface low in northern MS deepening to 996mb as it moves through TN! At 997mb it is just north of Florence, AL at 2PM. Sounds like the Euro's timing would be 6pm and later for Atlanta taken verbatim. Wouldn't surprise me to see them more backed locally than this at verification either. HOWEVER, with that said, we don't want them to get much more backed than due S or very slightly E of due south. This is one of those cases where, if they get too backed, downwind rain from the anvils will start blocking and impeding inflow winds. NAM showing this with only a 1006-1002mb surface low. 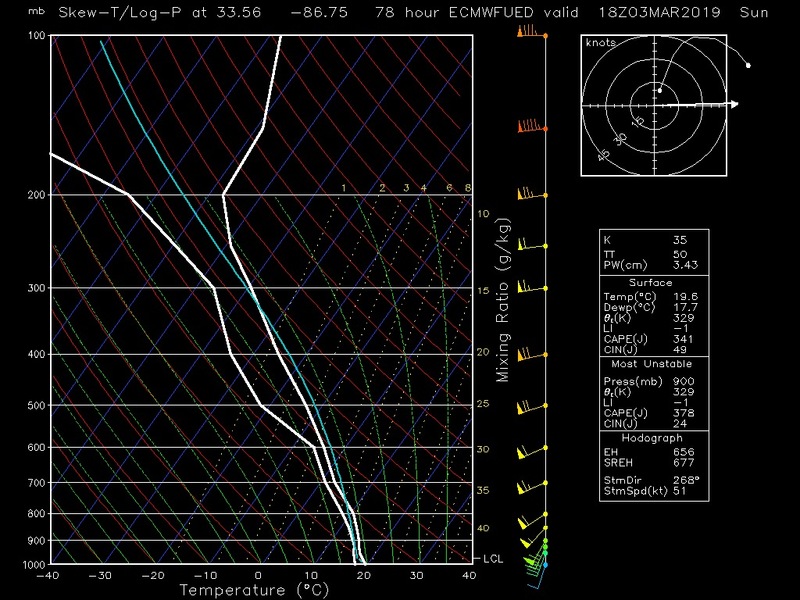 Crappy thermo plots here, but my goodness the wind shear at 18Z is a little scary. I know its the 18z NAM, but the quality of that warm sector for this time of year would be bad. Clearly a very favorable environment for tornadic supercells, discrete or embedded. I whipped up a quick GIF to show the differences in the various solutions regarding the northward progression of the warm front. As noted earlier, one of the biggest questions is how much rainfall over the TN Valley would shunt its movement north. The Euro is pretty adamant on depicting a large rain mass, which would lead me to believe that the warm front might not make it as far north as it depicts. I have seen this before, a this point I could see the warm front maybe getting as far north as I20, and that is a maybe. I think anywhere north of that is unlikely...but along and just south of the warm front, watch out.